I did this a while ago and thought I’d do it again this weekend. A smattering of my thoughts on a variety of subjects. Thanks to Forbes West, Jeff Carter, Debbie Robbins, Thomas Robins (no relation), Jen George, Travis Mohrman, and my brother for the ideas. With the impending release of Captain America 2: ‘Merica, I wish to share a story with you. This story will go to show the vast differences between my wife and me (besides the obvious). <——–The boys costume looked more like this. Yep. That’s Thor. 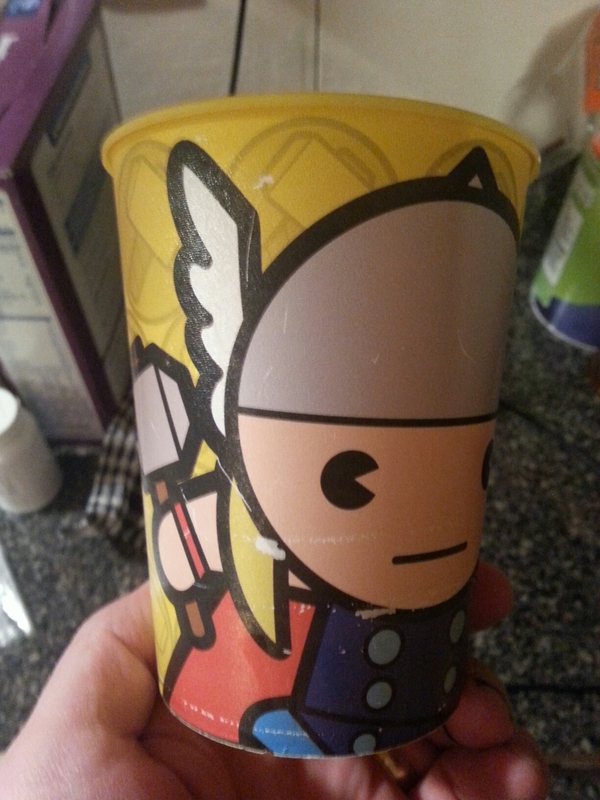 A few weeks later, I was shopping at our local Wally World and came upon this cup and bought a “Captain America” cup for my bride. And on that note, I am pretty psyched about the newest movie in the Marvel universe. In fact, my wife was bemoaning the fact there was a lack of black superheroes just yesterday and I was able to tell her that Falcon, (in fact, the first black superhero) is in the movie. It’ll be nice to have Falcon and hopefully other black superheroes for when I finally bring my son home from Africa. On a separate note — Bacon. Consider this: You have been gifted a magnificent ability. You realize one afternoon that your touch can turn the simplest of items into bacon. Bread = bacon. Potato chips = bacon. Green beans = bacon. Mushrooms = bacon. Bacon = bacon. 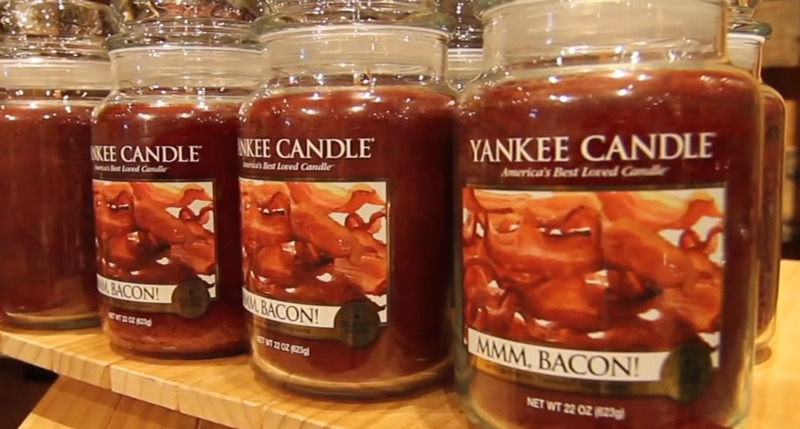 Then, you go to bed…bacon wrapped blankets and all, and in the morning you wake to the crackle and smell of smoke. Your house is on fire…check that…it is crisping. Your neighbors have been driven to insanity watching and smelling your house for the past day and will stop at nothing to get at the salty pork fat. As you lie in your bed, you munch on your cellphone and wait to perish with the rest of your glorious bacon. You realize no one should have this much power. With great power comes great responsibility and you can’t let this ability fall into the wrong hands. Yesterday my wife and I sold our Pontiac Grand Am. We’d had the car for over a decade and it had been a good car. I used it extensively for driving to and from sporting events while working as a sports reporter and it survived a trip to North and South Dakota about six years ago. It was a bit unexpected so we hadn’t cleaned it out yet. We found a lot of gross things (a pair of pliers covered in the remnants of exploded ketchup packets from the glovebox and a bottle of oil which had leaked in the back seat among others), some odd items (a racketball racket, multiple pens and pencils — the newspaper job, remember) and some nice memories. I found a custom-made Veggie Tales CD with Molly’s name inserted into various songs we used to play on trips. I found a dead watch my wife gave me for an anniversary gift. I sold the car that we brought our daughter home from the hospital in. We did some cleaning and sold the vehicle. It was a bittersweet day for sure. I also had a request today to talk about Southern Illinois defecting from the rest of the state and being annexed into Missouri. I must say, that is a fine idea. The corruption and waste of Illinois is well-known, but most people don’t realize the corruption is mostly limited to a fairly small area — Chicago. Now, I don’t have anything against Chicago, but there is no way for Southern Illinois to be able to swing votes in the General Assembly because they simply lack the votes. I think Illinois could be a great state if everyone could just get along, but even when the House, Senate, and Governor are all Democrats, they can’t get anything accomplished. What a shame. I’m all for joining Missouri or Indiana. Bring it on. 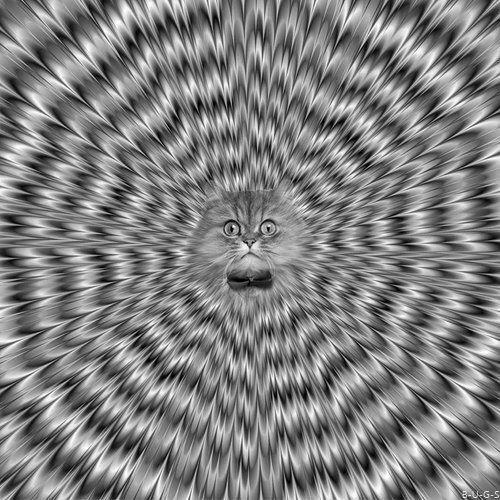 On a final note, here is a trippy picture of a cat. And so I’m sitting here after Economics class thinking about what I could possibly blog about when it keeps coming back to me — Trade-offs and Opportunity Cost. Now, when we talk in Economics, we’re usually talking about money, but not always. For example, we might say that you are in a store. You have $3 and can purchase a Snickers and a can of Mountain Dew, or you can buy a 20 ounce bottle of water and a pack of gum. You could also save the money and not get a snack. There you can see many trade-offs and the options listed are simple and not even indicative of the options you would even find at a regular Wal-Mart or Target. But, essentially that’s what a trade-off is — looking at what the options are and picking one. The one option (or multiple options) would be the trade-offs. You pick the Snickers and the Mt. Dew, you are trading that for a possibly healthier choice of water and gum. Or trading for the chance to save your money to buy something bigger and better in the future. And that’s where Opportunity Cost comes in. What is the value of that trade-off? There is some kind of value, monetarily or just perceived, to the choice you made. Let’s forget the shopping trip for a second and look at you after work. Watch The Real Housewives of Atlanta? Pick up the iPad for a rousing game of Candy Crush? Spend all night on Facebook and Twitter? Leave the house entirely for a walk or hit the gym? Again, there is no way I could possibly list all the potential alternatives you find yourself with each and every day. We all have our jobs and there are little options in that area. We go to work, slave away for the man, and earn a paycheck. But…it’s the moments we have to ourselves that define us. They make us who we are. If we just sit around all night watching the tube, what does that say about us? If we play game after game of some mindless app on our phones or tablets, what kind of person are we? But…if we choose to expand ourselves, to reach beyond what we are comfortable with and what we believe we can do, we can literally change who we are. What is the opportunity cost if we watch hour after hour of the Food Network and never once even attempt the recipes we see? What are we missing out on? To be honest, I’ve gotten busy with school lately, so my writing has taken a bit of a backseat until summer hits. I’ve written a little, but I gotta pay the bills right now. My evenings right now are spent recuperating from school, so mindless distractions are not always a bad thing and I won’t say they ever are. However, at some point we get stuck in that rut. We don’t get up and we let the distractions become our entire lives. Look at the trade-offs in your life and what the opportunity costs are? What can you do to make your life fuller? What are you missing out on by not looking at the alternatives all around? Back in 2004, a TV debuted that changed my life. 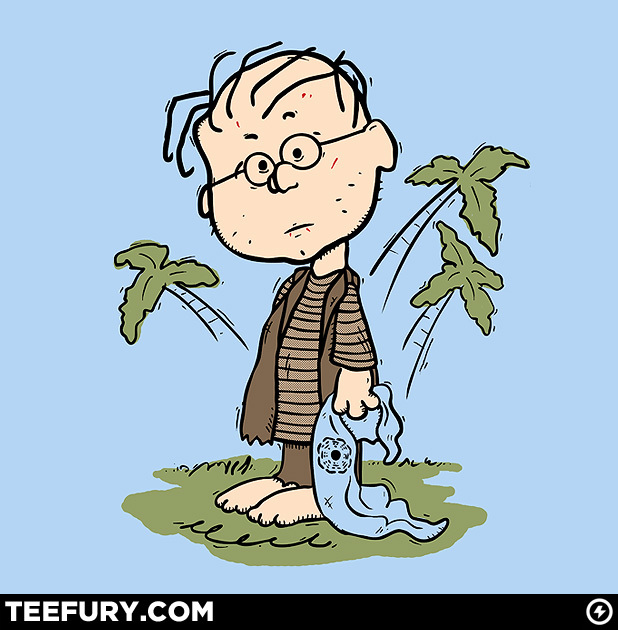 It changed the way I watched TV and transformed me from a casual viewer to a full-on nerd when it came to LOST. When that show was on, there were no distractions. It had my complete attention from the first flashback (or flashforward) to the preview for the next week’s show. I own this. Another full confession — I actually bought it as a gift for my wife. I now give better gifts or don’t give any at all. We still owned a VCR at the time LOST first started on ABC. It wasn’t always a problem, but after a little while, I started a Master’s Program that met on Wednesday nights. Thankfully, my wife, and then our friend Mischelle (who both unwittingly began liking a science-fiction serialized TV show) waited for me most nights. I’d get home and we’d immediately rewind the tape and watch the adventures of Jack, Kate, Sawyer, Locke, Hurley, Charlie, Sayid, etc. The mysteries kept us watching every week. Even when they “uncovered” one mystery, we got about 50 more. Brilliant. Holy smokes that was amazing. We get this whole storyline with Locke unearthing this mysterious Hatch only to find out that someone was already inside! And thus began my man-crush on Desmond. The introduction of Desmond’s character totally changed EVERYTHING I THOUGHT I BELIEVED about the island and its inhabitants. What I thought, though, was not even close to the truth of the situation. It was greater still. A shark with a Darma logo on it’s fin? I also own this shirt. I love it. LOST was perhaps the first show that I actively searched out clues on the Internet for what was going on. What was happening on that island? Why did the plane crash? Why them? Why those people? So many questions that we didn’t see answers to until the final season. As for that final reveal in the last episode — I was okay with it. I thought the entire season was a nice send-off. A lot of people didn’t get it, but by the time they were cruising into that finale, the show had picked up a lot of casual viewers and people who didn’t get it. I’m good with creators having their own vision and seeing it through. I don’t buy that they saw the ending on the first day of the show (see Nikki and Paulo), but they committed and went with it. 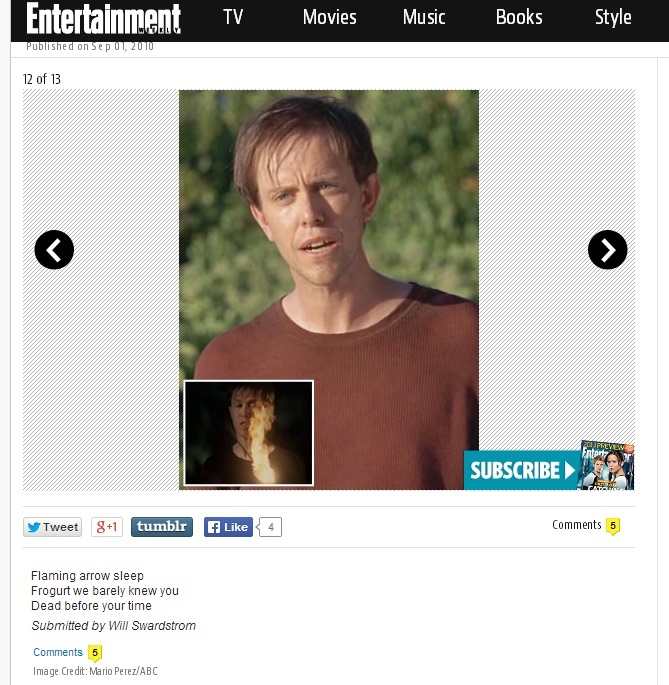 Mine was the final one in the EW.com LOST Haiku slideshow, but it was still a winner. 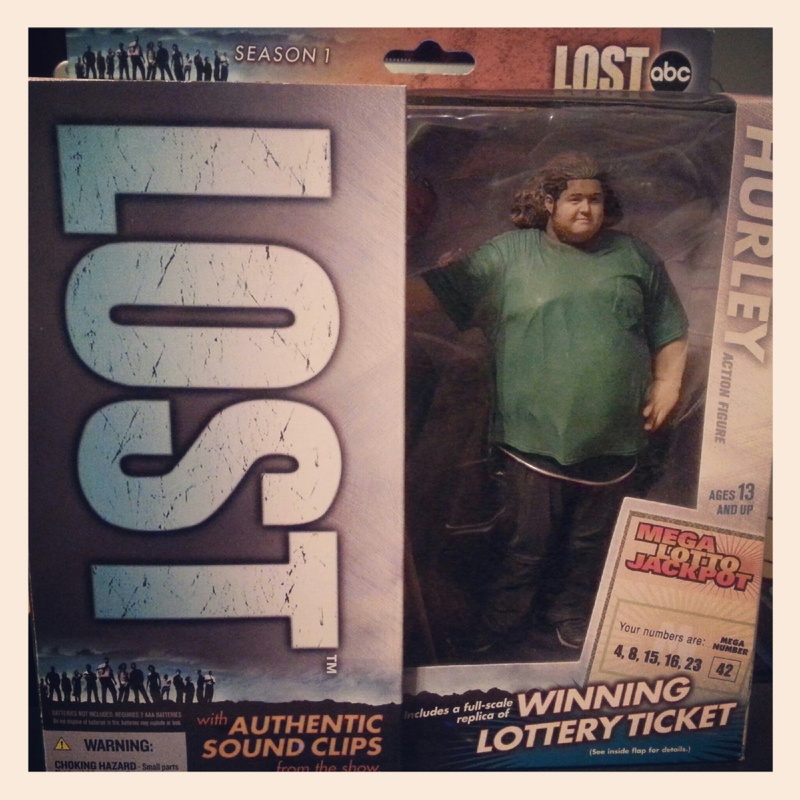 I enjoyed the LOST complete set, but did eventually sell it to bulk up my adoption fund. Since I can catch it on Amazon Prime, I don’t worry about it too much. I was so into LOST that when the show ended, I started watching ALL the shows the LOST alums started appearing in. Why yes, I’ll watch Hawaii 5-0 because Daniel Dae-Kim is in it. Why wouldn’t I watch Michael Emerson in CBS’ show Person of Interest? Eventually, the shows lost interest for me. H5-0 became dull after a year and a half. Alcatraz was a tough sell to most people and Person of Interest was good, but I just couldn’t commit to the show every week. LOST was unique and cool. I doubt we’ll ever have another TV show that entices us like that. I miss it and remember my time with it fondly. So today was the day I had the chance to read some poetry to my World History classes. I secretly love it — the chance to expose them to new and different words and ideas, the feelings and imagination of the writer, the silence in the classroom as I finish and the shock on their faces when they find out what the poem was about. We talked about Romanticism — the intellectual movement of the mid-1800’s. With Wordsworth, Blake, Coleridge, and Keats. Beautiful, vibrant words. A burning forehead and a parching tongue. Boy were they shocked when I put up a picture and told them it was a poem about a pot. A fancy pot, but a pot. 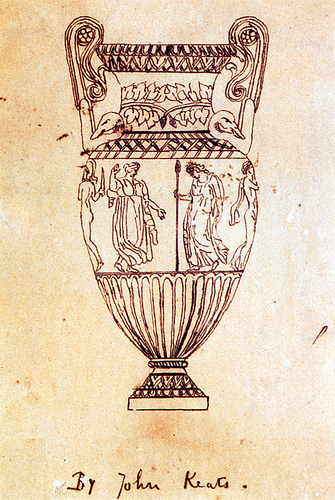 That’s right — the lyrical prose that Keats used in his poem was to describe what he saw when he viewed a pot. But, when we started really breaking down the words, the light bulbs going off above their heads illuminated the entire room. Ah, happy, happy boughs! that cannot shed / Your leaves, nor ever bid the Spring adieu — the trees on the urn are in bloom and full. They are continuously in a perfect state, but in that perfection, they are still. Frozen in time. They won’t ever experience the loss of leaves, but they also won’t see the rebirth of spring. Heard melodies are sweet, but those unheard / Are sweeter; therefore, ye soft pipes, play on; / Not to the sensual ear, but, more endear’d, / Pipe to the spirit ditties of no tone — The music we can play and hear is beautiful yes, but the sounds that the musicians on the urn play can be the most beautiful song in the world, yet we would never know it. The bard will continuously play his pipes, forever in silence, but forever in perfection. We could go on and on with this wonderful poem — a poem about a pot. And that’s the entire beauty of it. That we can find striking details and stroke our imagination even in the simplest of objects. I compared it to them lying on a hill and looking at the clouds. We see puppies and whales; pianos and jet planes; a T-Rex and a hot dog. What will our imagination show us when we perceive the simplest of objects. What can we bring to life through just our words?